Family orientation is one of my favourite days of work. Besides the fact that I sometimes feel like a monotonous robot, I love meeting my new class for the year. I love seeing students on their “best behaviour,” watching them interact with their parents, the sense of self that they exude, and the instant first impression that’s provided. But despite all that is happening, I often think about what it would be like to be a student again. The first meeting, the nerves, the unknown. Regardless of age, our students are kids. They need attention, boundaries, to learn lessons, and to be loved. Each student has an amazing gift to share. They all have their quirks (just as us teachers do! ), their challenges, their strengths, and their blossoming personalities. As teachers, we need to unpack all of these, understand our students, and build those strong relationships with them. Despite all that needs to be learned in a school year, the most important thing is learning who our students are. If we do not provide an environment structured around trust, respect, and care how can any form of learning be possible? 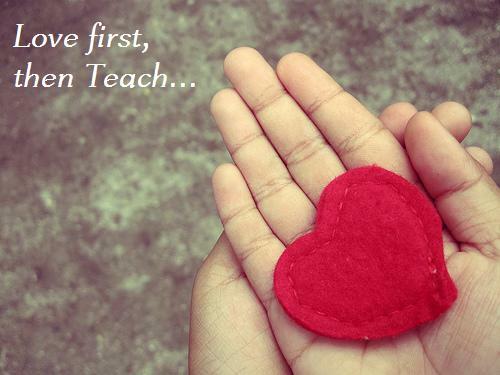 As each and every one of us begins our year, remember that sometimes we need to put the curriculum, our great units and engaging lessons aside, because if we don’t have the students’ hearts, we won’t be able to teach them. This entry was posted in Environments Conducive to Student Learning and tagged #firstdayofschool, care, know your students by ekpetley. Bookmark the permalink.